We’ve finished our conversation and the lights are now fully on. Where before you had learned a particular path to navigate the obstacles you kept bumping into, you can now see those obstacles clearly. Instead of blindly following a path that keeps you safe, you have a choice in the path you walk. You can see the path with full clarity. You can see the truth of the things that you’re avoiding, as well as what you miss out on as a result of the paths and patterns you’ve learned to follow blindly. You can see what might be possible from here, and what might get in the way. Everything feels illuminated in perfect clarity. Even the confusion you feel at some of what lies in front of you feels more crisp. Things feel sharp — in focus. This illumination is exciting and novel. Things look different — and you’re thrilled by what you can now see might be possible. The blast doors have been blown wide open and you want to go sprinting forward into the lush fields that lie ahead. The only problem is that, with this new, bright light, you can see all of the less pleasant stuff in front of you as well. The ugly-lights are turned up full beam, and some of what is being illuminated doesn’t reflect your highest self. You notice that the light switch we’ve turned on together has a dimmer switch next to it, so you turn things down just a smidge. You’re not turning the lights off, you explain reasonably. You’re just dimming them so that things aren’t so bright. It’s just to rest your eyes a little bit. It’ll make it easier to see everything starkly, when you turn them back up. It feels a little better. Actually, you feel even more committed now, because this new level of illumination is a little easier on your eyes, and you’re not forced to confront the scary stuff quite so vividly. Without all that fear confronting you, you’re even more committed to taking the step forward. Your eyes adjust. The field of possibility is a little less illuminated now as well, but that’s okay, once you take on the obstacles you can see in front of you, you can turn the light back on and get present to what’s possible. Still, even with the lights at this level, you can see an awful lot of what lies in your way. Maybe if you weren’t confronted with the sheer enormity of what lies ahead, it would be easier to take the next step. You reach over and turn the lights down a little more. Ahhhh. That feels good. You know you must be making the right decision, as you can feel your breathing deepen, your heart-rate slow, and your eyes adjust gratefully. You can’t really see out to the golden fields of possibility anymore, but that’s okay, you can see the door that leads to them, and you know that’s sufficient to keep you motivated. It’s more important that you keep your focus on what lies in front of you anyway, you tell yourself. 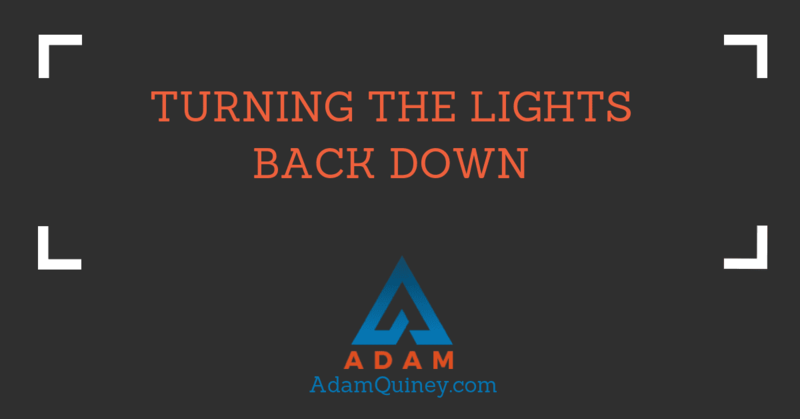 You do notice that while you are trying to tackle the immediate things in front of you, you keep getting distracted by all of the other things you can see you will need to address, so you reach over and dim the lights even further. Ah, perfect. Now you only have to keep your focus on the things immediately in front of you. To help illuminate those things, you light a candle. The soft glow the candle casts is comforting. It casts a dim circle of light out from around you, giving you just enough illumination to see the obstacles immediately in front of you. Perfect. You can focus on getting things done, without any distraction. Once you’re done here, you’ll turn those lights back on. Maybe flip them up to full blast for a moment, so you can get a sense of what you’re heading towards. But for now, you put your head back down and keep your attention on the problem in front of you. Once that’s all solved, then you can really start moving towards those doors you vaguely remember seeing. Standing beside the light switch, I feel my heart break. I want to turn the light switch back up to full. To give you the gift of seeing your truth. But that’s not currently your path. “Just a little longer”, you share, head down, safely distracted by the endless task of addressing the obstacles in front of you. “Ouch!”, you exclaim, bumping into something you couldn’t quite see in the near-dark. “I’ll have to remember that”, you say out loud, making a mental note and ensuring you take a different route next time. Perhaps you’ll be ready to turn the lights up another day.